When we say “fall,” what comes to mind? Do you think of drinking apple cider and crunching leaves, or pumpkin carving and trick-or-treating? We all have strong memories of this season, and there’s no better place to make these fall memories with your little ones. Here in Mansfield and Richland County we are packed with classic fall activities your kids are going to love. Nothing brings back memories of fall like spending time in the crisp autumn air or the smell of an apple picked right from the branch. It’s “pick-your-own” season at Apple Hill Orchards. Open Monday through Saturday from 8am to 6pm and Sundays from 10am to 6pm to pick your own apples. New varieties ripen all throughout the season so make sure to check their website for ripening times for your favorites. Come out on the weekends for a hayride through the orchard, but don’t leave without a taste of their handmade cider and a hot apple donut. They are one of the few orchards that still produces fresh, unpasteurized cider on location. With over 20 unique family attraction, Fun at The Barnyard Park will delight your kids with a full day of fall fun and put you in touch with your inner child. 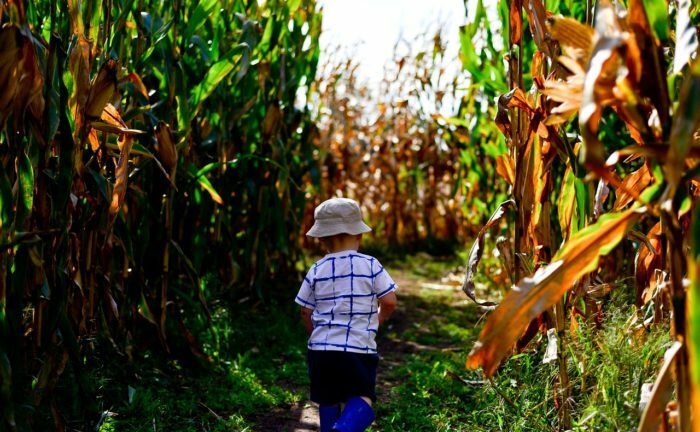 While adults will love getting lost in the fun and challenging 4-acre corn maze, kids will love the kiddie maze, hayrides, zipline, jumping pillow, corn box, apple blaster, pumpkin checkers, train rides, bounce house, gemstone mining, pumpkin bowling, corn hole, a pumpkin slingshot and so much more. Make sure to bring your camera; there are plenty of photo ops throughout The Barnyard as you and your kids play your way through the entire day. Don’t miss this event before it goes away; October 20 & 21 is the last weekend to get in on all the fun! Octoberfest at Wayne’s Country Market happens all throughout the month of October with activities for kids from preschool through 3rd grade. Open during store hours, the barn activities are free for all to enjoy and include a straw maze, zip line, rope swing, slides, and a corn bin. While you’re there, stop in the market for some seasonal produce and your favorite selections of autumn wines and beers. Sorry Charlie Brown, but The Great Pumpkin has nothing on The Great Pumpkin Glow at Kingwood Center Gardens. This regional favorite is back and bigger than ever with over 2,000 lit pumpkins on display. Wander in awe through the grounds to marvel at the pumpkins and harvest décor and look for familiar characters in the carvings and in the alley of friendly scarecrows. Your kids will love the Lil’ Carvers Carnival, the horse-drawn hay rides and you’re going to love the food trucks and live music. There’s all this and more, so make sure to get your tickets for this amazing fall event – it’s only open Saturday, October 20 from 5pm to 10pm and Sunday, October 21 from 5pm to 9pm. For your little monsters, over 60 merchants in the historic downtown of Mansfield will open their doors to trick-or-treaters for the Downtown Mansfield, Inc. Monsterfield Masquerade. Trick-or-treating will take place throughout downtown from 10am to 12pm when guests are encouraged to head to the parade route for the Halloween Parade. The parade will kick off at noon from the corner of North Main Street and 5th. The floats will move south on North Main Street towards Park Avenue West where they will make a right turn. From Park Avenue West, the parade will turn right onto Walnut St and then head north. More family fun for all ages can be found with Fall Fun at J&J Reitschlin Farm on Saturdays from 12pm-7pm and Sundays from 1pm-7pm through October 28. This year’s theme is the Wizard of Oz so follow the yellow brick road to every activity. Pay as you go and explore a corn maze, ride a hayride, and enjoy unlimited play for the little ones in “munchkin land.” For only $1 per person to park, there will be a Wizard of Oz movie night, October 20 at 7:30pm with the movie starting at 8pm. Popcorn, snacks, and drinks will be available at the concession stand. Finally, we can’t forget about the foliage. Take in the beautiful colors of the changing leaves with a hike through the fields and forests of the Gorman Nature Center. Grab your bikes and pedal through diverse landscapes along the paved B&O Bike Trail. There are even more great trails through Richland County to explore all throughout the fall. Did you take a photo that captures the splendor of fall at one of these awesome family-friendly locations? Share it at at info@destinationmansfield.com.